I have a few public performances coming up this summer, if anyone wants to catch a show. Mon 30th July at Margam Country Park (Port Talbot SA13 2TJ) up at the castle. 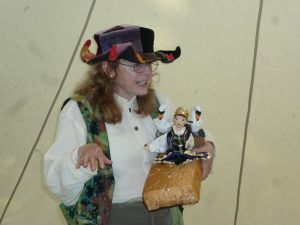 I’ll be alternating Earth Tales and Fire Tales at 11.30am 12.30pm 1.45pm and 2.45pm. It’s a lovely venue so do come and join me (the event is free). Sat 18th August I’m performing at the Worcester Live Festival at the Henry Sandon Hall at 10.00am 11.30am 1.00 pm and 2.30pm. I’ll be telling Water Tales and Air Tales. Mon 20th August at Margam Country Park (Port Talbot SA13 2TJ) up at the castle. I’ll be alternating Water Tales and Welsh Tales at 11.30am 12.30pm 1.45pm and 2.45pm. It’s a lovely venue so do come and join me (the event is free). My other exciting news is that I’ve been booked to perform a brand new set of stories at Sci-Fi Weekender X in North Wales next March. This will be a geeky Time Travel Tales set, which I’m in the process of creating. It’s going to be fun building the puppets to use with this one! Well, it’s been a busy few months, and my work has taken me to all kinds of wonderful venues. 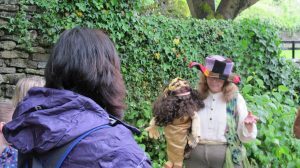 I’ve performed at a number of Festivals, including the Settle “Festival of Happiness”. 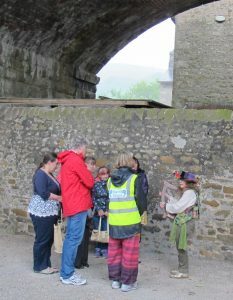 As well as performing under canvass in the morning, I did my first story-telling walk….in the wettest and most thundery of conditions. Amazingly people turned up for the event, and even seemed to enjoy it! 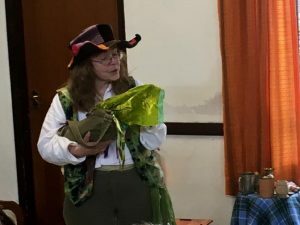 We did have to take shelter under a railway arch at one point, and trying to keep the puppets and my little harp safe and dry was a challenge…..but I’d love to do another story walk….especially in the dry. It did stop raining eventually. 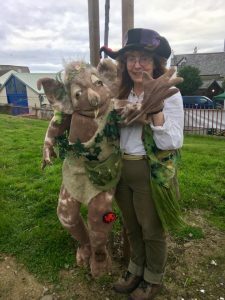 I was fortunate enough to be asked to perform at Celtfest, on the Isle of Man, always my favourite island, and it was lovey to have the excuse to visit it again. 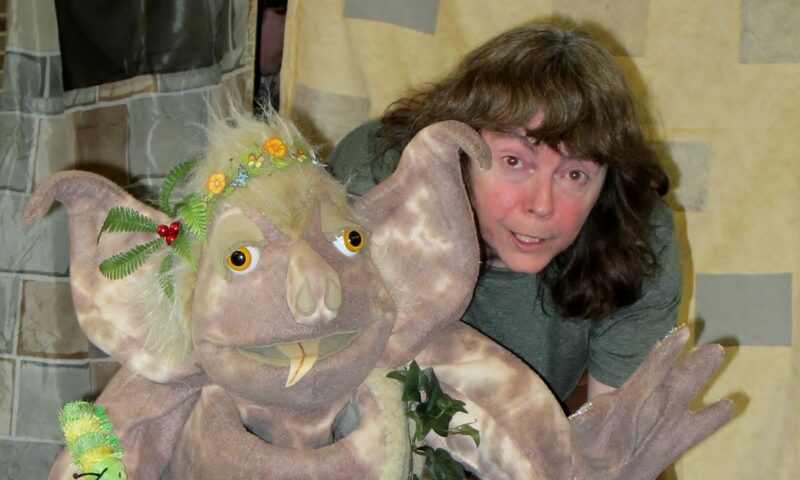 I also had the opportunity to perform at Ludlow Fringe Festival, Greenwood Forest Park and Stackpole Walled Gardens…..all in all a busy and enjoyable summer. Now I just need to plan my autumn diary. Fiona is also a writer, of novels as well as folktales. In addition she builds puppets not only for her own work, but for other people’s too. Abertillery, Gwent, South Wales, UK.